The Phoenix heat is no joking matter in the summer. We tend to hover in the triple digits during the day, which can make daily life absolutely miserable. It’s next to impossible to sleep when the nighttime temperatures don’t get below 90 degrees, and June, July, and August can seem to stretch out to infinity. Our air conditioners are our closest allies and keeping them running strong is a top priority. Because they work so hard (pretty much constantly) during the summer, they wear out faster than other air conditioners. Though modern units are designed to last for many years, staying on top of maintenance can greatly increase an air conditioner’s lifespan. Despite the best care, no air conditioner lasts forever. Every home owner gets into the weird zone where it isn’t clear whether a tired A/C unit should be replaced or repaired one more time. On one hand, you don’t want to invest in repairs if the unit is just going to fail in a week or two. On the other hand, new A/C units don’t come cheap, and it’s important to get the most life out of your current unit as possible in order to save money. How do you know it is time to retire your current unit and invest in a new one? Repair Frequency. How often has your air conditioner required repairs in the last year or two? If you’ve had to majorly repair the unit twice in two years, that’s too often. It means your air conditioner is probably going to break down in the near future, especially if no one is maintaining it. At this point, it might be good to invest in a fresh start and have the new unit professionally maintained to prolong its lifespan. A/C Unit Age. How old is your air conditioner? The average unit lasts around 10-15 years. If your unit is past its prime, it’s going to need more and more repairs. As a result, it’s probably not worth pouring more money into it. Instead, you should speak with an HVAC professional from the team at Integrity about your options for a new unit. Your Comfort Levels. 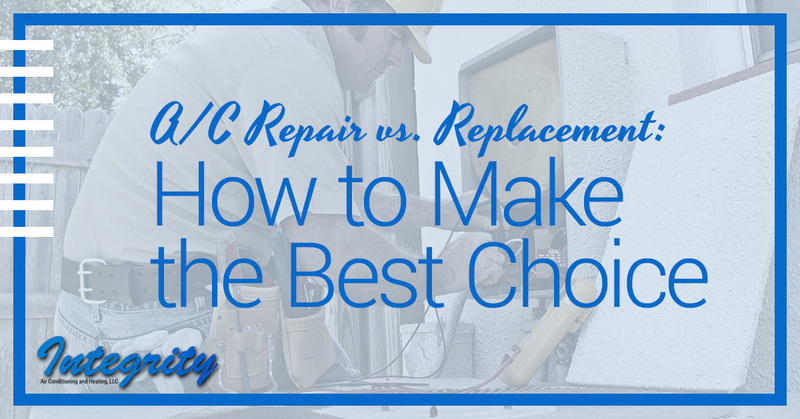 If you’ve repaired your air conditioner a few times and it still isn’t keeping you comfortable, there is nothing wrong with investing in a new unit. Your current unit may be too small, installed incorrectly, or just bad quality. We will gladly examine your current unit and find a replacement that gives you the comfort you need. The Warranty Has Expired. Now, we aren’t saying that you should replace your unit the instant its warranty runs out. That being said, if the warranty has ended and your air conditioner is starting to majorly fail, you’ll be paying a lot to repair it. You may be better off putting that money toward a new unit. When you sit down with an expert to discuss your options, you need to be able to trust that the expert has your best interests in mind and isn’t just trying to make a sale. Our team is happy to take the time to understand your budget, your home, and your comfort level needs. We proudly provide Phoenix with world-class HVAC service, including air conditioning repair and replacement. Contact us today!